In May 2016, television producer Doug Delony was jogging on his regular route through Discovery Green Park in Houston, Texas. Something in the park caught his attention, so he snapped a photo with his cell phone camera. However, he had no idea the image would spread like wildfire and touch the hearts of millions of strangers all over the world. 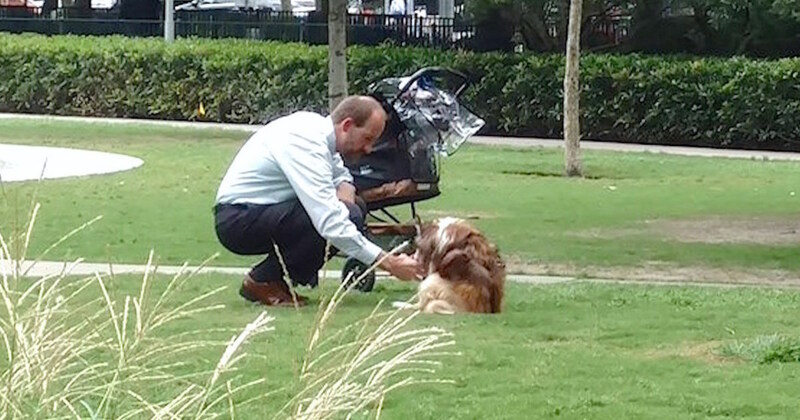 Doug’s picture just showed a regular guy kneeling down to pet an older dog. And there was a baby stroller at his side… but no baby. Apparently, the man in Doug’s picture had no idea Doug had taken his picture. Doug’s friends and viewers of the TV station were curious when they saw the picture. Everyone wanted to know more about the dog and the man with the stroller. So Doug investigated. It turned out that the dog was named Maximilian, but everyone calls him Max. Max was 16 years old. He had lived with owners Edie and Troy ever since he was a puppy. Max was born blind in one eye and had severe osteoarthritis, but his family loved him more than anything. Every day Edie and her husband, Troy, put Max in a baby stroller, went to the park, and saw their old friend come to life. Unfortunately, Max died in June 2017, but through this story, he’ll be remembered forever. Please share this heartwarming story with your friends on Facebook and help us remember this lovely dog and his wonderful owners!